There are currently ten varieties of chillies that were developed through Chinese space mutation breeding, this year I was offered seeds of several of them and grew Hangjiao #5 space chilli Helix Nebula. The history of space vegetable breeding is relatively long, interesting and filled with propaganda and deliberate misinformation. I certainly don’t know all the details. There are many reports of all seeds that are sent to space returning to grow huge plants with unimaginable yields that are incredibly nutrient dense. There are even some photo shopped images of vegetable plants that are absolutely covered in massive fruits. Unfortunately this is largely propaganda designed to be enticing and build excitement over this field of research, but the reality of space mutation breeding is slightly different. The reality is that the Chinese government has been doing space breeding since the late 1980’s and they love it. In Northwest China's Gansu province, "space peppers" account for more than half of the local capsicum market. Chinese fields are planted with 405,000 hectares of rice fields with space seeds and 8,100 hectares of space vegetables. So the Chinese have a reasonably long history with space breeding and have dedicated a large amount of land and resources to it. More recently America and a few other countries have started to dabble in space breeding. They have dedicated huge amounts of money to space mutation breeding, various NASA press releases and web pages make rather impressive claims, but their results have been less than impressive to date and I am not aware of any space vegetables that anyone other than the Chinese Government have bred and released that is in any way noteworthy. The Chinese government have been working at space breeding for so long, and they have sent hundreds of kilograms of seeds into space (consisting of many millions of individual seeds), and around 12% of seeds sent to space in satellites manifest mutations of some kind, and in China there appears to be no consumer reluctance to space vegetables, and even though China has sent seeds of more than 400 plant species (and countless varieties) to space, only around 66 varieties of space vegetables (10 of which are chilli) or space rice or space flowers have ever been stabilised and kept. Ten varieties of space chillies exist at the moment. All of the other countless millions of mutated plants were not desirable and the lines were grown out, assessed, and subsequently disposed of. They were not named and sold to gardeners as space curiosities, they were disposed of because they were simply not worth keeping. This indicates that each of the 10 varieties of space chilli are rather exceptional in some way or another. There are reports that space breeding produces chillies that are far more nutrient dense than other varieties of chillies, unfortunately I have not been able to confirm or refute this claim as I do not have access to any reputable studies that have been conducted in this area. 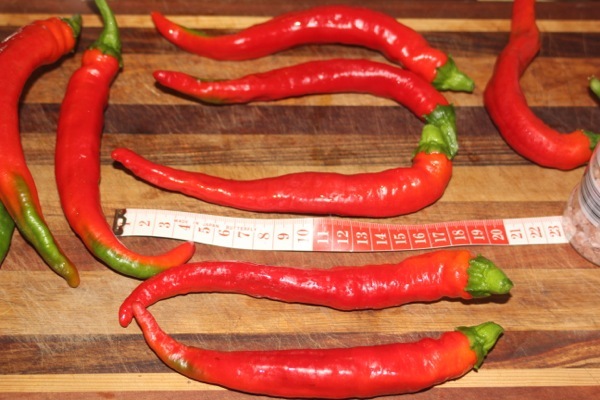 The Hangjiao #5 space chillies I grew were very productive and do grow reasonably large fruit. I found that germinating Hangjiao #5 space chilli Helix Nebula seeds was relatively simple, the young seedlings grew easily, but the heat of summer killed them and I had to replant my seeds. 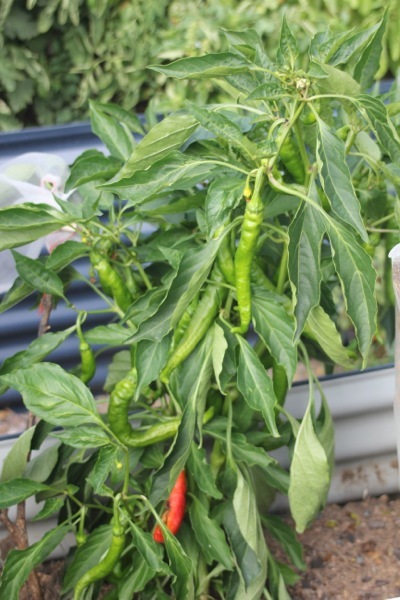 This past summer was odd and many of my vegetable plants suffered in different ways, but the space chillies needed extra help to get through the heat when they were small. I gave them a bit of shade, and a little more water than my other chilli varieties while they were tiny, and after that they grew well and really didn’t look back. The plants reached 1 to 2 feet tall and flowered profusely. While many of my other varieties of chillies aborted flowers for weeks on end due to the hot weather the space chillies flowers generally all set easily. This fruit grew far too slowly for my liking, which may have been due to the weather or the sheer amount of fruit that each plant carried. I bagged a few flowers to isolate and produce pure seed, this bagging and exclusion of pollinators did not seem to effect fruit set. It also means I now have a small amount of pure seed saved. Once the space chilli plant was covered in unripe fruit it did not seem to slow down production as I would have expected, it just kept producing more. The weather started to cool so nothing was ripening fast, I ran out of patience so I ate one of the green pods. It was alright, not hot, it was juicy and crunchy, nothing overly spectacular, but not bad in any way. My kids really liked it, but that may have simply because of the novelty of eating a space chilli. I would not grow them again for the green space chillies as I didn’t find them great other than impressive yield produced on a small sized plant. Once the space chillies started to ripen red I ate another one. This was much nicer than the green one and after eating them ripe I plan to grow them again this year and will consider getting a few more space chilli varieties. The ripe space chillies were sweeter and hotter than the green ones. The pods were each roughly 20 cm long, some curly and others straight, and evenly red when ripe. They are crunchy and juicy, they have heat but are not overly hot at all which is surprisingly nice, and they do not smell very strong or fruity. I am bad at describing taste but have heard them described as tasting like a capsicum, or having an apple sweetness, or tasting similar to a crunchy pea pod, which all are reasonable descriptions. I counted the number of chillies that grew on one plant. Over the season 53 large red chillies ripened and a lot of other unripe green ones were on the plant but the frost hit them. Had I started the seeds earlier, or had I over wintered plants, I would have gotten a whole lot more chillies. Even so, 53 large chillies from one plant is certainly not bad. I have also been told that they are mostly grown for use in stir fry. Given their high productivity, sweetness, relatively large size, crunchiness, and reasonably low heat I think they would go well in a stir fry. My kids also tried some ripe red space chilli and much preferred them to the unripe green ones. Being low in heat means the kids had no trouble eating them, and as these chillies ‘came from space’ the kids are very eager to eat them and happily eat as many as I let them eat. I think space chillies are a great vegetable for kids to grow, they are low maintenance, high yielding, tastes good, very healthy (high in Vitamin C etc) and, being ‘from space’ means they are fun and likely to be eaten by children. 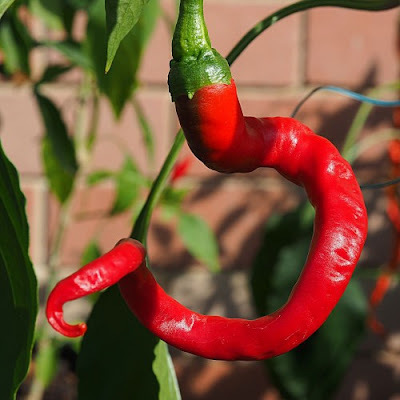 Space chillies can also be used as a starting point for discussions over genetics, mutations, plant breeding, space and so forth so can be used as a sneaky educational tool. There are a few places that sell space chilli seeds in Australia. I have considered tracking down all ten varieties of space chilli and growing them, but I probably won't because I just don't know what I would do with the bags and bags of chillies that they would produce. Chillies cross pollinate readily with other varieties of chilli and capsicum so only buy seeds from people who isolate flowers to save pure seed. 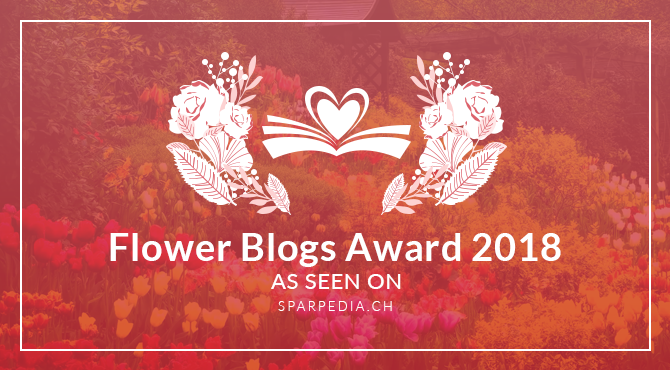 I bagged some flowers and saved pure seeds from them this year. 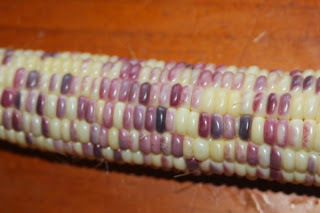 If I have any extra seeds they will be listed on my for sale page with all of the organically grown perennial vegetables and vegetable seeds that I have for sale.